Containing a mass of hydrogen plasma in the shape of a cored apple may be the key to creating viable nuclear fusion reactors. For a moment, a miniature sun lights up inside the Princeton Plasma Physics Laboratory, a small campus of anonymous white buildings three miles northeast of Princeton University in New Jersey. Within a tangled merry-go-round of wires and red copper coils, a ball of plasmaa charged gas of hydrogen nuclei and electronsheats up to 70 million degrees Fahrenheit. The plasma blazes supernova bright, then instantly goes black. Although the whole episode lasts less than 500 milliseconds, physicist Masayuki Ono seems pleased. "For plasma that's a long time; the particles do a lot in a hundred milliseconds," he says. As project director of the National Spherical Torus Experiment, Ono is in the optimism business. He's searching for a practical way to harness nuclear fusion, the process that causes stars to burn. If he succeeds, our energy worries are over. Fusion reactions are incredibly potent and produce almost no pollution. The fuel for a fusion reactor is hydrogen, which can be extracted from a cup of ordinary seawater. There's one big catch: Despite a 50-year effort to make fusion commercially viable, no one has been able to start a reaction, keep it going, and keep it contained. Yet now, just as the United States casts about for alternatives to imported oil, Ono and other fusion researchers insist they are getting closer to success. Physicists around the world largely agree about how to tap fusion power. Trap a hydrogen plasma in a magnetic fieldmost fusion experiments use a doughnut-shaped magnetic bottle called a tokamak. Drive the temperatures up to about 180 million degrees Fahrenheit. Then sit back and let nature take its course. Under those conditions, hydrogen nuclei hit each other with so much force that they sometimes stick together and fuse into helium, releasing an enormous amount of energy in the form of fast-moving neutrons. The whole point of fusion is to get out more energy than you put in, but no one has succeeded in doing that yet. In 1994 the Princeton Plasma Physics Laboratory's $300 million gymnasium-size Tokamak Fusion Test Reactor generated a record 10.7 million watts of power, yet it operated at a loss. The Joint European Torus reactor near Oxford, England, has done better but still hasn't passed the magic break-even point. "We've turned theory into reality but at a deficit in energy and only for a few seconds. We need to do it 24/7 if we're going to make cheap electricity," says Rob Goldston, director of the Princeton lab. Seventeen years ago Princeton physicist Martin Peng thought about these problems and theorized that a magnetic bottle in the form of a spherical torus, resembling a cored apple, could produce the same power output using less energy than a tokamak. The apple-shaped reactor would require smaller magnets that cost less to build. Best of all, the torus could keep plasma in a tighter configuration, making fusion easier to achieve. Peng's vision took shape as the $25 million National Spherical Torus Experiment, or NSTX, which began operating in 1999. The machine has 12 long, curved magnets running top to bottom around the outside and a cylindrical array of magnets through the core. The magnets confine a sphere of hydrogen plasma while blasts of microwaves heat the particles to millions of degrees. The reaction chamber is lined with 2,700 graphite tiles and a multitude of sensors that measure the density and temperature of the plasma. Current test runs with the reactor are not hot enough to attain significant amounts of fusion, but they reveal a great deal about the behavior of plasma in a spherical torus. So far the news is good. NSTX is twice as efficient as earlier reactors, achieving a beta valuethe ratio of plasma pressure to the pressure of the machine-generated magnetic fieldof 25 percent. "We're getting more bang for the buck," Peng says. Furthermore, the spherical magnetic bottle has an unexpected benefit: Under certain circumstances, the ability of the system to contain energy improves with increased plasma pressure. With a conventional tokamak it's usually the reverse. "The plasma has a self-healing property that is working against instability," says Ono. In a prototype fusion reactor at Princeton, red magnets hold plasma in place while microwaves heat it to millions of degrees. A complementary machine in England, the $15 million Mega Amp Spherical Tokamak, or MAST, is providing additional support for the spherical design. Alan Sykes of the United Kingdom Atomic Energy Authority, who manages the project, was originally inspired by one of Peng's talks in the mid-1980s. Sykes got encouraging results from a small prototype that he built out of spare parts from another fusion machine. "Now MAST is where we sort out the details," he says. A primary goal is to reduce the size of the column of magnets at the center of the torus in order to scale down the size of the reactor, which would significantly reduce construction costs. While the British and American groups think smaller and cheaper, an international fusion collaboration is going the other way. The planned International Thermonuclear Experimental Reactor could be the first machine to generate significant amounts of surplus fusion powerif it is built. The reactor's staggering price tag, estimated to be $6 billion, prompted the United States to back out of the project a few years ago. Even if the fuel is free, a $6 billion power plant would not be a commercially viable venture. MAST and NSTX point to a less-expensive approach, but neither one is close to breaking even, much less generating any usable surplus. Christopher Flavin, president of the Worldwatch Institute in Washington, D.C., questions whether fusion will ever transcend its history as an expensive curiosity. "The post-fossil fuel age will be defined before fusion comes along," he says. Fusion is a centralized business, meaning that the government is the only one spending money on it. Flavin sees the world heading instead toward decentralized, renewable energies such as solar, wind, biomass, and fuel cells. Renewables now provide 8 percent of the total energy in the United States, but Flavin thinks they could climb to 50 percent by the middle of the century, leaving little place for fusion: "I wouldn't rule it out, but it's one of the longer shots that there is." So far, the federal government is standing on its bet. The Department of Energy spends a steady $250 million a year on fusion research. The largest chunk, about $70 million, goes to Princeton. In May President Bush's national energy policy endorsed developing fusion energy as a power source for the next generation. And Rob Goldston still has stars in his eyes. Although he doesn't anticipate commercial fusion reactors until 2050, he thinks that's just fine. He is preparing for a time far into the future, when fossil fuels are gone or no longer acceptable due to global warming, and renewables alone cannot provide enough juice. "By 2100, reactors could supply about half of America's electricity," Goldston says. "This is a long-term issue." 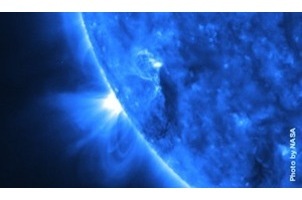 The Princeton Plasma Physics Laboratory maintains an extensive Web site containing general fusion resources and information about the lab's experiments (www.pppl.gov), along with a second, education-oriented site (fusedweb.pppl.gov). The United Kingdom Atomic Energy Authority (www.fusion.org.uk) provides complementary information and a British perspective on fusion research.